Captain David Nicholson is the Special Operations Bureau Commander. He is a graduate of Radford High School in Honolulu Hawaii and holds a Bachelor of Science Degree in Criminal Justice Administration from California Baptist University. In 1989 he attended the San Bernardino County Sheriff’s Department 95th basic academy session and upon graduation, became a deputy sheriff for the San Bernardino County Sheriff’s Department. 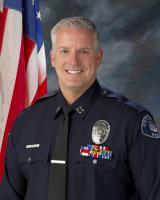 In 1990, he started as a patrol officer with the Ontario Police Department. Captain Nicholson has worked a variety of assignments, which include; Patrol, Gang Violence Suppression Unit, Field Training Program, Bike Unit, COPS Unit, Narcotics/Vice Unit, SWAT and Investigations. He helped create the Department’s Multi Enforcement Team working alongside the United States Marshal’s Office as a task force officer supervisor for seven years. Captain Nicholson has held supervisory and command positions in; Patrol Operations, South Area Command, SWAT/Crisis Negotiations, COPS/MET Division as well as the Gang and K-9 Units.